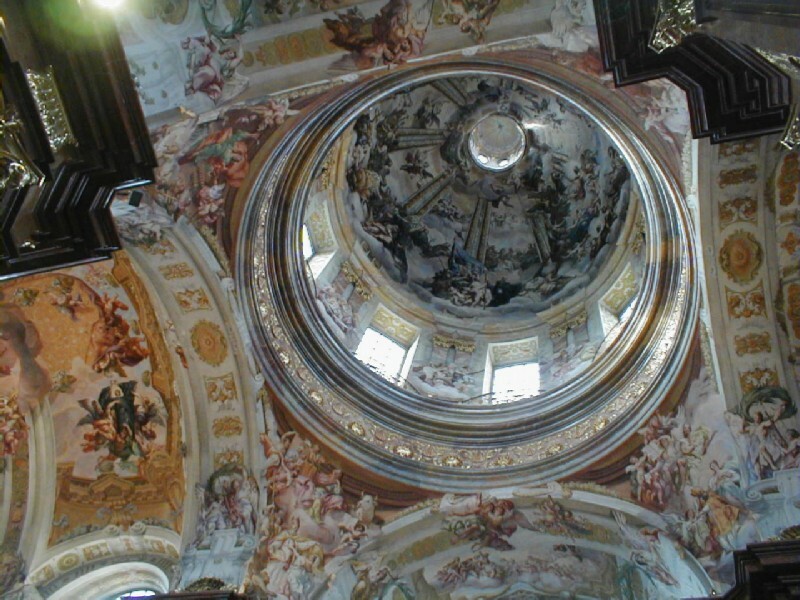 The layover day was designed to allow those who had not seen it to tour the Melk Benedictine monastery. Originally a castle belonging to the Babenburg dynasty, it was given to the monks for use as a monastery in 1089. 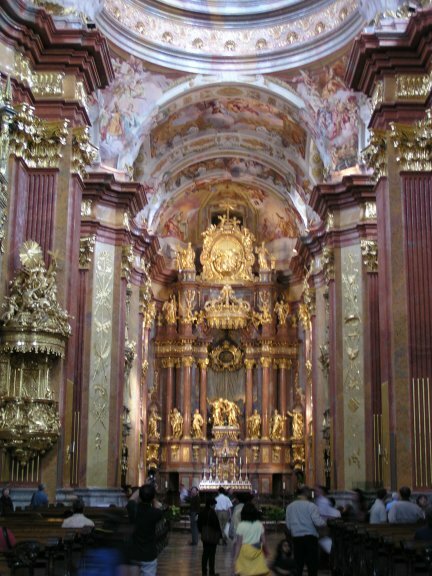 The current baroque buildings were built between 1702 and 1736. The library, billed as the largest monastic library in the world dates from the 12th century. 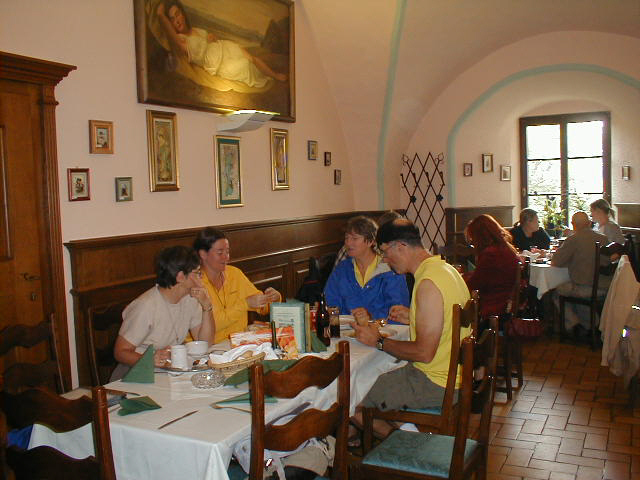 Having lunch at Schloss Schallaburg, a 900 year old castle on the outskirts of Melk. 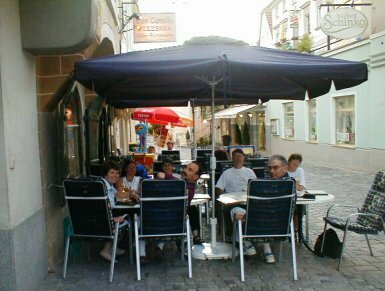 Italian restaurant in pedestrian zone of Melk. 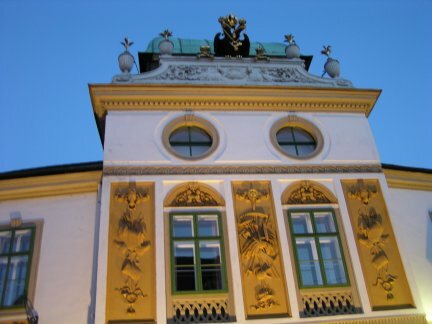 Public building in Melk viewed at night. 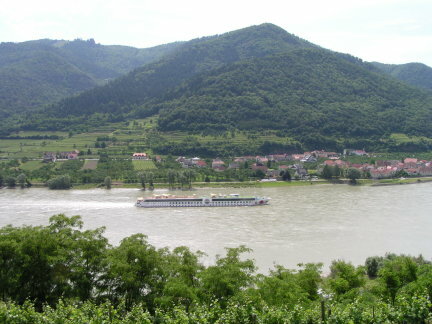 The first 25 miles, from Melk to Krems, took us through the area called the Wachau. The two main features of this region are castles and vineyards, both of which dominate the steep hillsides on each side of the river. 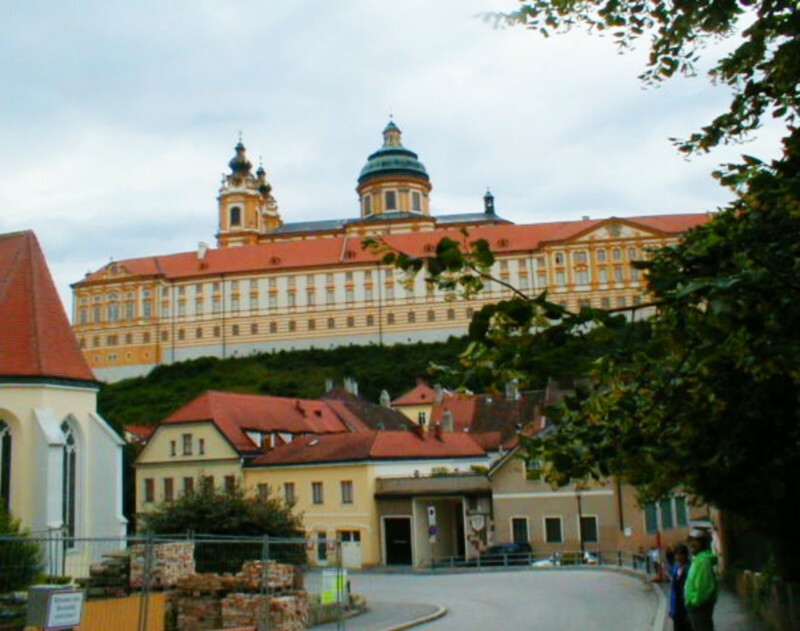 After we crossed over to the north bank from Melk, we followed the bike path though terraced vineyards and small, historic towns. Only when the slopes reached almost to the river did the bike path drop down and run between the road and rail line along the river. Vineyards with the Danube in the background. Our first stop was in Spitz in order to climb up a foot path to Ruine Hinterhaus, one of the better preserved castle ruins. 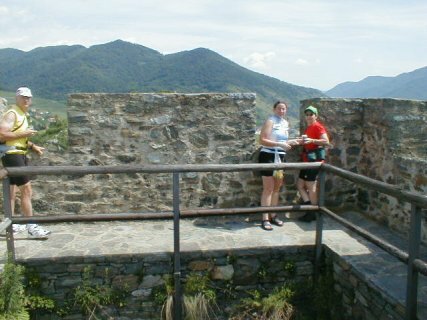 On the ramparts of Ruine Hinterhaus. View across the Danube from Ruine Hinterhaus. 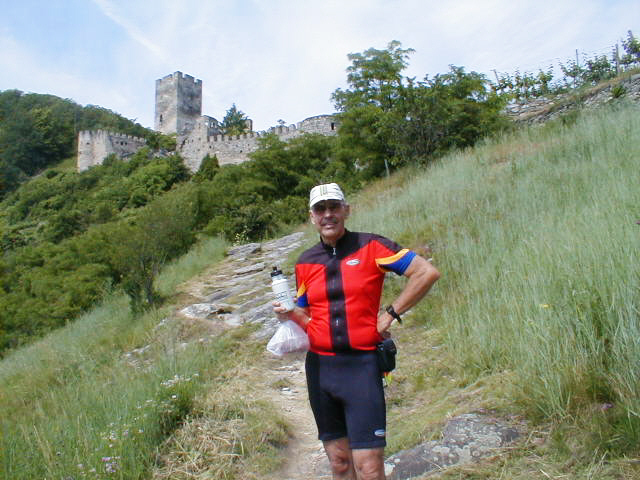 Some of us did not get enough of castles so they also climbed up to Burgruine Dürnstein where the English King Richard the Lionhearted was imprisoned on this way back from the Crusades in 1192. 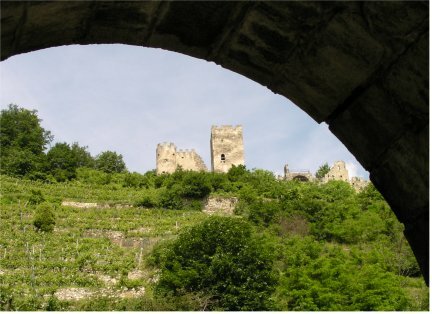 The ruins are located above the town of Dürnstein, the most popular destination in the Wachau for coach tours. The castle was reported to be a disappointment after Ruine Hinterhaus because it was ... well ... much more ruined. 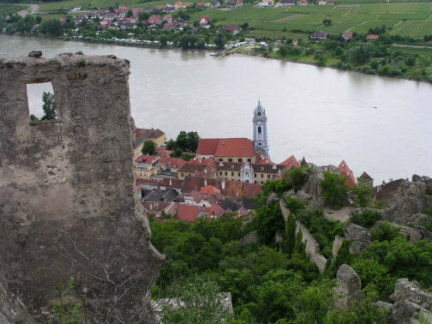 The Danube and former Augustinian Monastery in Dürnstein viewed from Burgruine Dürnstein. Just before Krems an der Donau, which marks the end of the Wachau region, we crossed over to the right bank of the Danube in order to reach our night's lodging in the small wine village of Hollenberg. With about 5 miles to go, disaster struck. The bottom bracket of Jeanine's bike broke off, leaving only the threads still in place. My brother Gary produced a rope and used it as a tether to pull Jeanine. Fortunately, there was only one hill; and it did not faze him. Her bike was an old Schwinn touring bike that she had inherited from our son who bought it used for a trip from Denver to Quincy about 12 years ago. 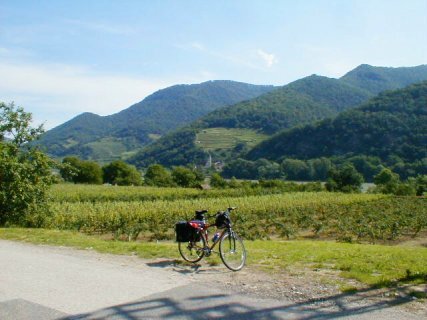 I had become complacent because during last year's Austrian tour, it was the only bike that was not new and the only one that did not break down. Although we successfully reached the privatzimmer, I thought we were in dire straits since it was Saturday evening. Nothing is open on Sunday; and for once a SAG wagon (railroad) was not nearby. But the 81 year old lady of the house came to our rescue. She called the church in a nearby village to find out Sunday service times and a garage next to the church that also fixed bikes. She said drop off the bike at the garage when we eat supper nearby and it will be ready after church. No sooner were we leaving for supper when it started raining. She called the gasthof, whose owner came and got us. After bringing us back after supper, he took the bike to the garage. 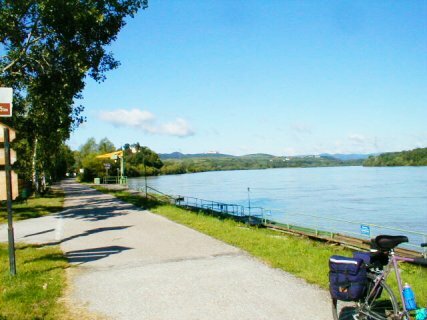 Today was another free day; and I had planned a side trip to Krems an der Donau, 7 miles away. 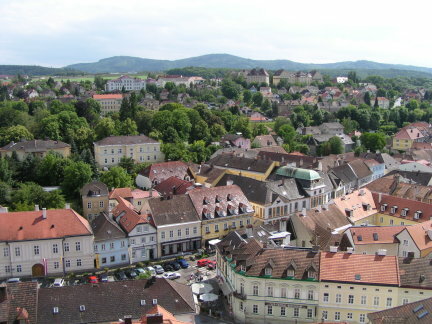 Krems dates back to before 995 and claims to have one of the most beautiful town centers in Europe. 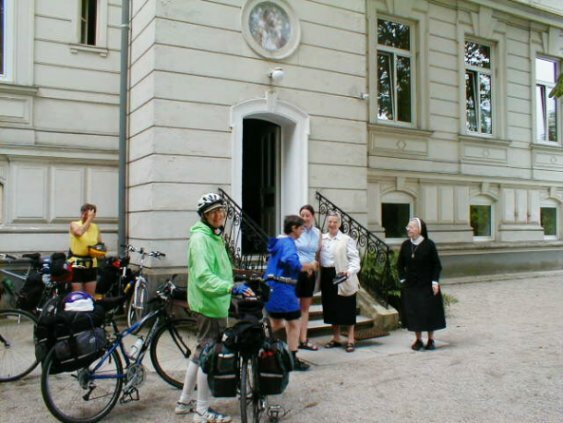 It was still raining, so we donned our rain gear to ride 2 miles to the church in the nearby wine village of Wagram. Sure enough, the bike was as good as new when I picked it up after church. It continued raining all day, so reading and card playing were the order of the day. The lady's granddaughter visited from Vienna; and we enjoyed a long conversation with her. The only disappointment caused by the rain was missing Krems. This was the third time I had passed within sight of it without actually entering it. 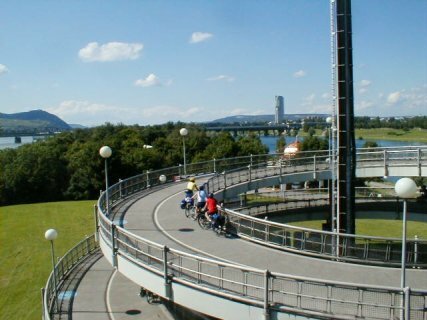 The sun was shining when we climbed back onto the bicycle autobahn for what turned out to be our longest day. 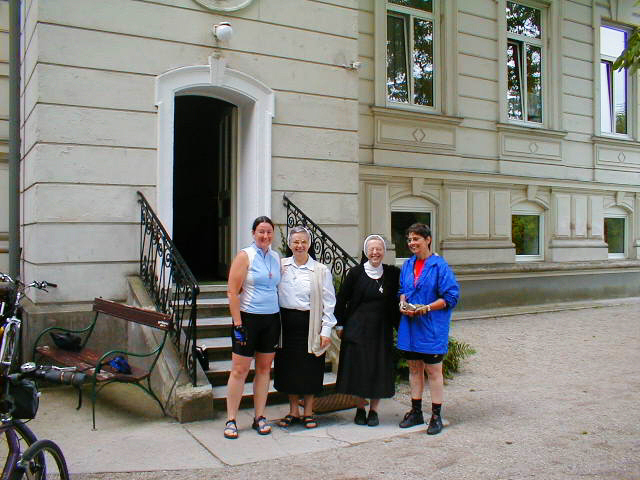 With Frau Seel (second from right) in Hollenberg. I had borrowed her bike to go to church the previous day and left it in the garage in the rear (shown) which was 3 blocks and up a hill from the front of the house on the main street where it had been parked. The next morning at breakfast, I asked her if she would like me to return the bike to the front of the house. She said it was already there; she had already ridden it to the store. She was 81 and her husband, who died 16 years earlier, had been at Stalingrad. At the Wien (Vienna) city limits. Not a very impressive entrance to a very impressive city. In Vienna the Danube splits into two channels plus what is called a canal. I am sure some of the extra miles was due to crossing the Danube (quite wide by this time) from the main route on the right bank of the canal which went near our hotel, to the island between the two main channels. I planned to stop at a small tourist office in a large park that takes up the whole island. Unfortunately, it had disappeared sometime since I was there in 1998. I also didn't take the shortest route to the Prater, through which we needed to ride to get to our hotel. Instead I detoured through city streets in order to show everyone the famous Ferris wheel in one end of the park. 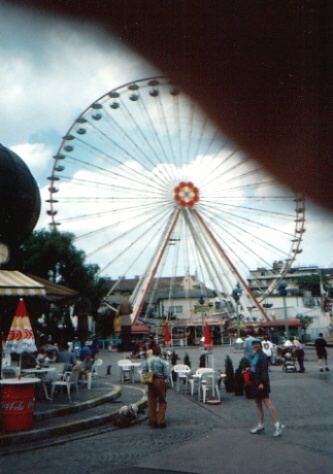 Huge Ferris wheel in the Prater. It was featured in the movie "The Third Man". The Prater is an enormous park near the center of Vienna. Formerly an imperial hunting preserve, it was opened to the public in the mid-19th century. 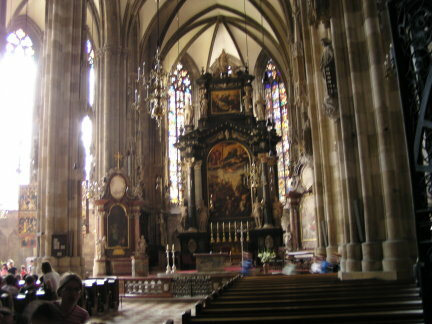 The guidebook says it is 45 miles from Hollenberg to Vienna. Our cycle computer said it must have been another 10 miles to our hotel. We stayed at the brand new Etap St. Marx hotel located in the Landstraße district. An apt internet review described it as having all modern conveniences but lacking in "flair". The 47 Euro price for a double room, compared to a minimum of 80 for smaller, older two-star hotels (presumably with flair), made up for the lack of that commodity. Landstraße (literally "highway") also aptly describes the district, an area of newer business and industrial buildings strategically located near the east-west autobahn and the highway to the airport. Also nearby was the so-called Gasometer, several huge natural gas storage tanks dating from the 19th century, recently converted into shopping, entertainment, and eating venues and apartments. 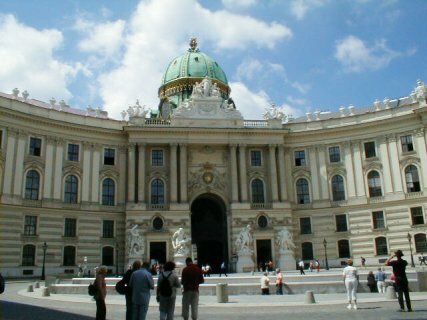 Because I had already been to Vienna three times, I scheduled only one day for sightseeing before flying back. Since my sister and her friend were nervous about their new, expensive bikes and my brother and his wife had to change in Paris to Delta which requires boxes or bags, I rode to the Vienna airport to see what I could do while the rest set off for the center of Vienna. At the airport the Air France agent, after making a phone call, said that there were no boxes or bags. However, he said he would have 6 BAGS sent that afternoon from Paris for 6 Euros per bag. I even wrote down for him my name, flight number, and number of bags required (4), as well as my brother's name, flight, and number required (2). The results are described below. I recorded 15 miles on the odometer looking for the airport and but only 10 on the return trip. 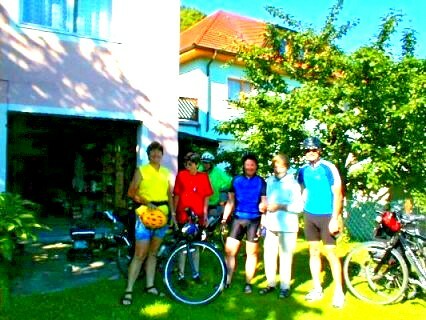 I later took the bike path from near our hotel to the center of town (Altstadt) to meet the rest of the crew for supper. They had opted to take the convenient U-Bahn (subway). 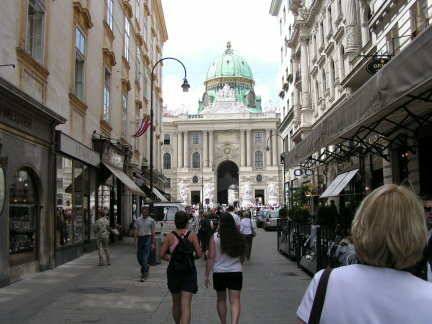 Kohlmarkt, one of the pedestrian only streets in the center of Vienna, with the Hofburg (Winter Palace) of the Hapsburg emperors in the background. Museum of Natural History along the Ringstraße in Vienna. 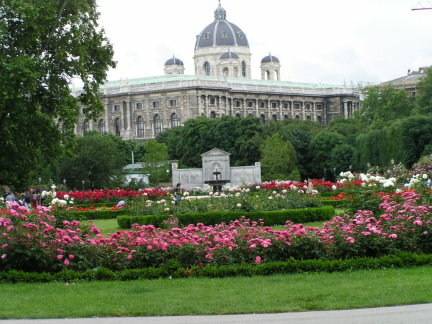 The Ringstraße is a boulevard circling the old city center. It and all the grandiose buildings along it were constructed in about 1860 when the original city walls were demolished. After easily locating the nearest S-bahn station for the trip to the airport, we discovered that Vienna's suburban trains do not have a bike car. Instead, all doors on all cars had the bike symbol. 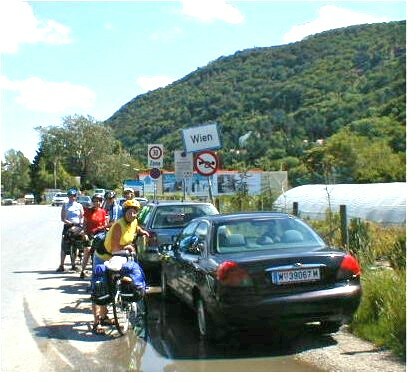 You simply bring your bike on board. Normally this would have presented no problem because it was after rush hour; but this day we encountered a large number of school children with gear on their way to summer camp. It was a tight fit; but everyone took it in stride. I had one last opportunity to carry on a rudimentary conversation in German with one of the teachers. When we got to the airport, the same agent I had dealt with the day before was on duty. He said he had only 2 BOXES for the four bikes on our flight. No problem ... my sister and her friend had protection (I was not concerned about ours). They proceeded to do the disassembly required; and we applied some foam pipe insulation to the tubes for protection. A little later when the agent actually had time to get the boxes, he now had four available. I said no thanks. After routine flights back to Dulles Airport in Washington, the results were: 1 bike with box and 2 without boxes arrived safely; and my sister's with box never left Vienna. It was delivered to her two days later minus the box, plus scratches in the only spot that she had not covered. I believe Air France later made a reasonable financial settlement. I later found out from my brother, whose flight left much earlier than ours, that the agent had never heard of him although he (the agent) was able to produce the piece of paper I had given him the day before. I forget the details, but this was the start for them of one of those journeys everyone fears: waiting in long lines, running to flights, missed connections, etc. The piece of paper I gave to the agent was written in English and German. I am convinced the agent was French because I had never before encountered incompetent Austrians.